Congratulations to our Mock Trial team, which won the Circuit 10 Mock Trial Competition on Thursday, February 7th at the Bartow Courthouse. What is Mock Trial? 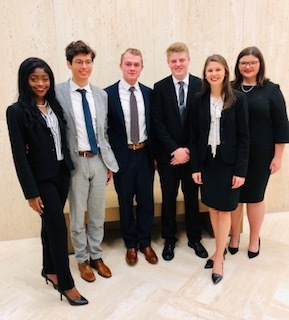 The Florida High School Mock Trial Competition is an academic competition in which a team of 6-8 students simulate the roles of both attorneys and witnesses in a fictional trial situation. This is the most hands-on, intensive learning simulation about the trial process available to high school students. 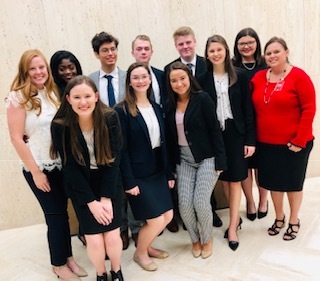 The Mock Trial Team competition was on Thursday at the Bartow Courthouse and the team faced George Jenkins Law Academy and Bartow Academy of Legal Studies to determine which school would represent Circuit 10 at the State Championship for Mock Trial Competition in March 2019. The following students participated in this competition: Abby Branham, Ama Fosu, Annie Bolter, Trent Curtis, Keaton Walding, Jace Gravitt, Faith Nagy, Emily Branham, Lucy Bolter, Seth Martinez, Tag Hunt, Riley Rhoden, Carter Sawicki, Haley Caylor and Alina Peek. Abby Branham is the “Top Attorney” in Florida and “Top 10” in the world for High School Mock Trial teams. And Keaton Walding is ranked #2 “Witness” in the world. The team has been coached by the amazing Chasity Branham with assistance from Judge-elect Melissa Gravitt. If you haven’t seen these students in action, you’ll be amazed by their capability and poise under pressure. For the sixth year in a row, this Mock Trial team will represent the 10th Circuit at the Florida State Championship March 14th -16th 2019 in Orlando. These students appreciate your support and LCS looks forward to seeing this amazing team in action again soon.